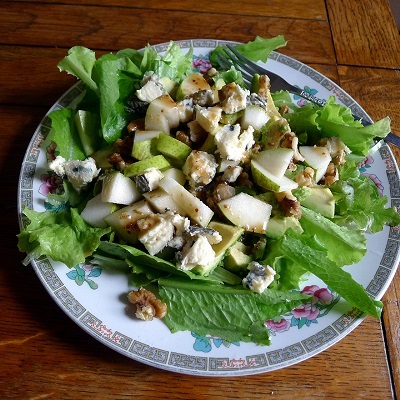 You'll love this Pear Salad if you like Gorgonzola cheese married with avocado and pear and enhanced with sugared walnuts. 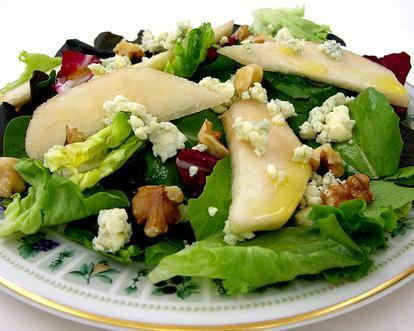 This restaurant salad recipe is a favorite during the fall and winter months when fresh pears are readily available. 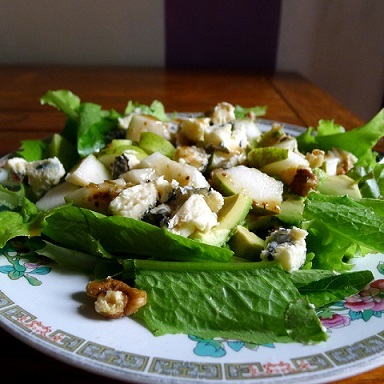 This salad recipe actually specifies using Gorgonzola cheese, a milder variety of blue (bleu) cheese. I use it at the restaurant with some recipes because there are some people who prefer a milder bleu cheese, but if you like Stilton or Roquefort, the recipe will work just as well. You can read more about cheese by clicking here. And for additional clarification about bleu cheese read the Bleu Cheese Butter Recipe. What kind of pears do I use? Most often I buy Bartlett pears because of their availability and because, from my experience, almost everybody who likes pears, loves Bartlett's. If you want to know more about pears, please read the article about pears. There are more than 3,000 varieties! Click on the link to read about the most common ones in the U.S. Preparation time: 15 minutes (after you have your sugared walnuts ready). Serves 4. That's it! Plate and serve your delicious restaurant recipe for salad. Enjoy your salad and the company of those you share it with! Pears are indeed a "gift of God."